It separates the pool water from the heat source which equals less product maintenance and a longer life. A complete factory assembled package reduces installation cost and time while maintaining effective heat transfer and extended firing cycles. 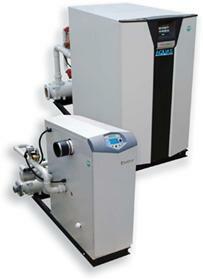 The Aua pool packages are built with stainless steel condensing boilers which deliver up to 97% thermal efficiency. Standard on every 4000,000 to 800,000 btu/hr package is the Smart System control with LCD display, Navigation dial and 5:1 turndown. Standard on every 1,000,000 to 1,500,000 Btu/hr package is the Smart Touch control with touch screen display and 10:1 turndown. This means programming and data retrieval at your fingertips.